Digital Marketing for Financial Services Summit will take place in New York, 9-10 of December 2014. K-message offers its readers a VIP code 20% discount for this event. The event is addressed to three main groups of attendees. The first and the obvious one: Digital Marketing in Financial Services Professionals. If you work (or planning to work) in bank marketing, insurance, credit card or financial services brokerage, consider this event as a networking and learning opportunity. The second target group of the Digital Marketing for Financial Services Summit are agencies and vendors. If you offer digital, interactive or 360° brand communications solutions, content creation and media planning, tracking, measurement, analytics or customer insights, you may find some financial services leads at the event. The third group of attendees are IT vendors. Marketing Automation, SEO, CRM, Social Media Management – within financial industry all those digital marketing tools are still a novelty. Andrew Artemenko is a passionate, creative, and professional marketing leader with 10 years of interactive media experience. Currently he manages digital strategy and microsite architecture at Bank of America. Mr Artemenko brings a unique skill set to his teams by providing strategic guidance and tactical execution. Peter Eliopoulos began his banking career in 1988 as a Management Associate with Citibank, and then spent 10 years with the management consultant firms of A.T. Kearney and Mitchell Madison Group where he advised financial services and media companies on strategic growth and organizational improvement initiatives. JR Badian, Vice President of Digital Marketing and Social Media at MasterCard Worldwide, is credited with an amazing number of business accomplishments. Not only is he a digital and social media marketer, and an entrepreneur in the global brand digital marketing space, but his first marketing agency went public before he was 30 years old. This spring, he was applauded as one of “40 under 40” brand innovators. Bryan VanDyke is Executive Director and Head of Digital Strategy at Morgan Stanley, where he is Charged with defining and executing a unified digital vision that delivers value to the Firm’s diverse set of clients, partners, shareholders and employees. Prior to Morgan Stanley, Bryan was Vice President and Head of Digital Strategy at Prudential Financial, where he established a User Experience center of excellence and stewarded the creation of Prudential’s first social and mobile assets. 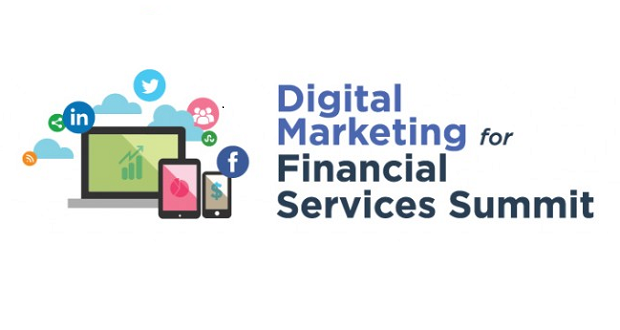 What is in the agenda of the Digital Marketing in Financial Services Summit? According to the draft agenda, Digital Marketing in Financial Services Summit is very interesting. Day 1 includes an interesting Case Study on Omni-Channel integration of Social Media, Mobile and Web with offline activities to drive conversions and customer acquisition. There are two tracks to follow afterwards. The first one focuses on Social Media and Video content. We find particularly interesting presentation on Compliance while implementing Social Media into your marketing strategy. The second track focuses on Search Engine Marketing. We still find Search as an incredibly efficient tactic, and the focus of Digital Marketing in Financial Services Summit is on how to expand this channel with active use of Social Signals and by improving quality of the content to get even better results. At the end of the day the focus will be on Content creation and management. How to build your content to build engagement, increase share of voice and increase your customer base? How to automate your editorial workflow and manage your digital assets? Those answers, we hope may be answered during day 1 of the Digital Marketing in Financial Services Summit. Similarly to the previous day, there will be two tracks on the day two of the Digital Marketing in Financial Services Summit. Track 1 focuses on mobile tactics. You will learn how to get value from mobile interactions – from text messaging through apps to the mobile and responsive web. There will be also discussion on how to design your web experience to deliver the best experience to your mobile users within omni-channel marketing efforts. Track 2 is about B2B relationships. How can you empower Sales Team with Digital. An interesting case study from Curian Capital will show the power of interactive video in B2B connection with prospects and clients. In the evening there will be another interesting case study. Have you ever considered using gamification to increase financial literacy of your leads to make them into the savvy customers?